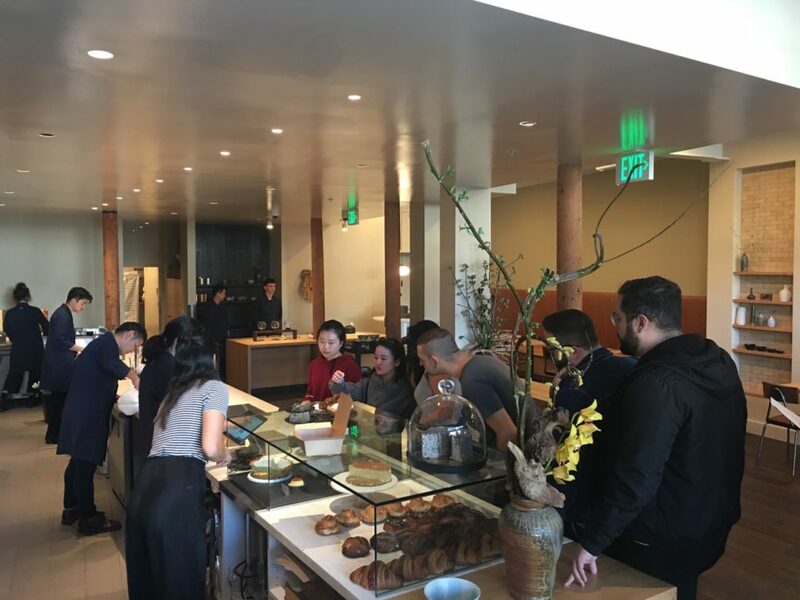 Bright and early Saturday morning I joined Anna from the Tea Squirrel waiting in line for the grand opening of Stonemill Matcha, San Francisco’s first and only premium matcha cafe. We were both excited to experience everything Stonemill had to offer, and neither of us left disappointed. The minimalist design of the interior is clean and nicely lit. The pastry case is full of incredible treats. We got the matcha croissant and the chashu danish. To be honest the croissant was good but the matcha didn’t seem to do much to improve it. The chashu danish was phenomenal. 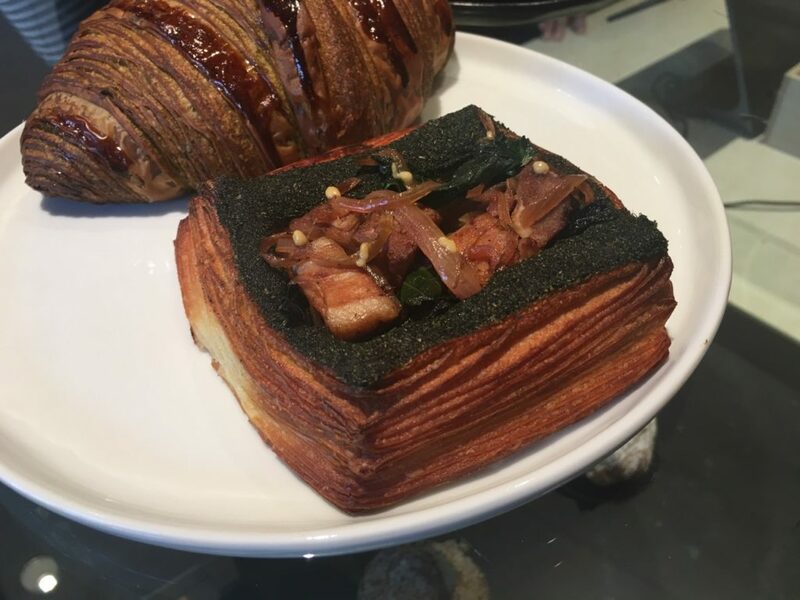 The crunchy, flaky pastry was topped with ground seaweed and filled with chashu, carmelized onions, more greens, and what must have been fresh wasabi. In fact, the wasabi is probably what made the filling so phenomenal. It had the same spice you’re used to but so much added flavor it couldn’t possibly one of those cheap tube knockoffs you get at the grocery store. Okay enough about pastries, what about the matcha? 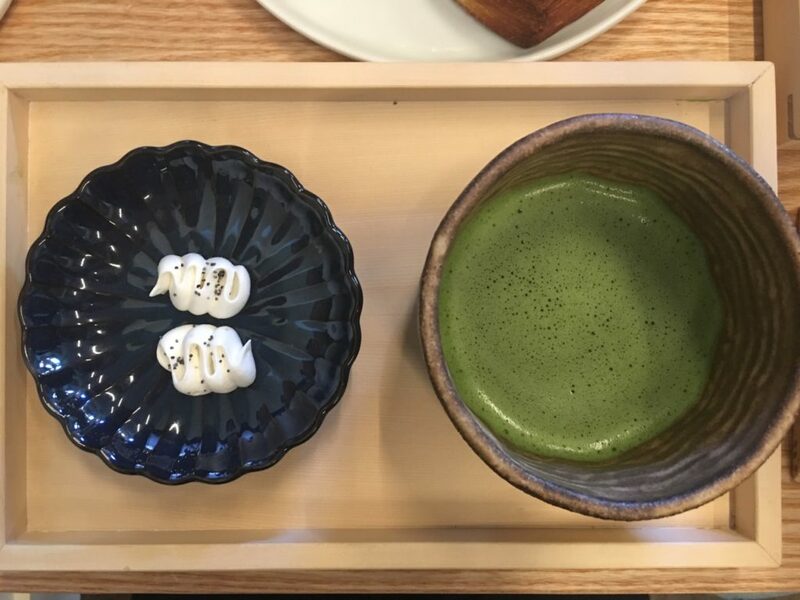 My wife and I each ordered a hand-whisked matcha and then a matcha latte to share. 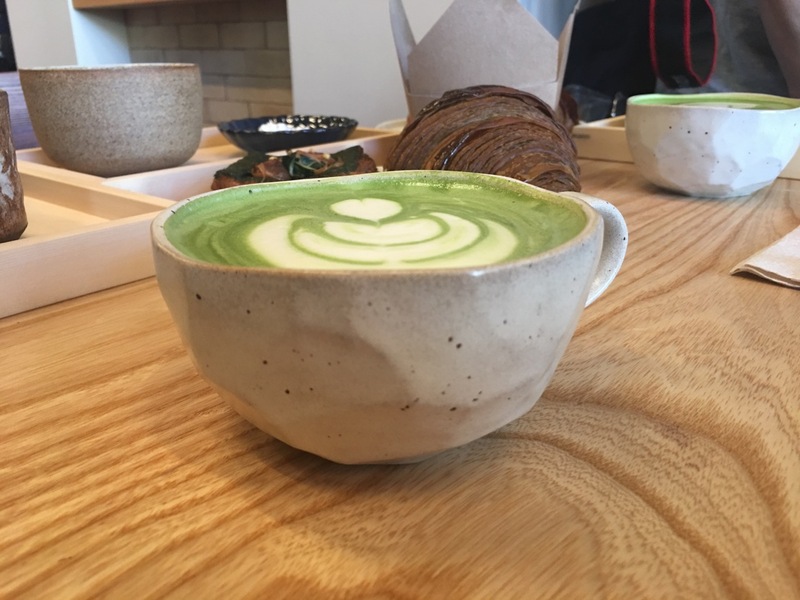 The handwhisked matcha is made to order at an area in the back of the cafe. There was a young American man there whisking matcha under the watchful eye of a Japanese man in his 30s or so. I could tell immediately by the way he was brewing he was either nervous, new to brewing matcha, or both. This showed in the finished product, which was mine to drink. The Japanese man whisked my wife’s matcha. The difference between the two was immediately apparent. 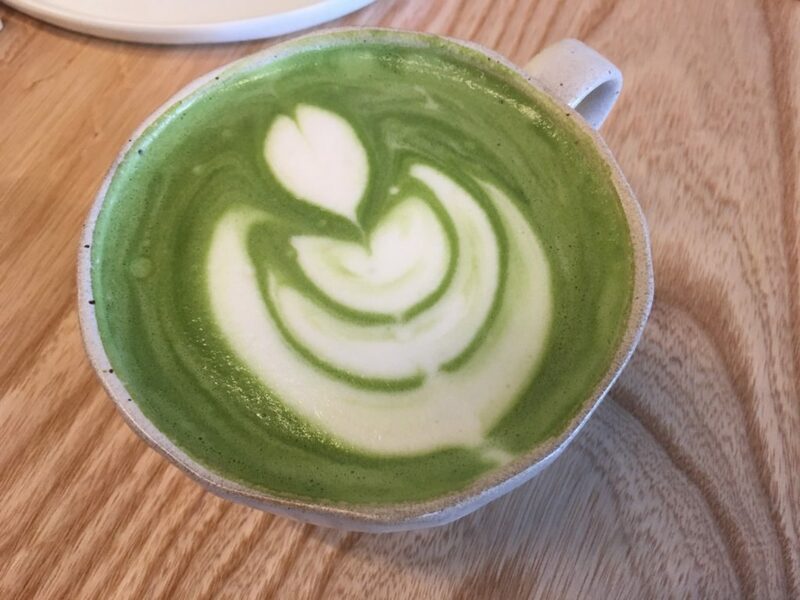 My matcha was thin and didn’t feel whisked properly to fully integrated the tea and create the creamy, luscious texture and blended flavors you expect from matcha. In fact, when I finished the cup there were some unmixed particles at the bottom. My wife’s cup, on the other hand, was smooth, rich, and just plain delicious. I chalk the difference up to nerves and inexperience. The matcha latte was flawless. Delivered in a beautiful stoneware cup, it was lightly sweetened in a way that enhanced the beverage without overpowering it. I strongly recommend you try the latte if you go! I will definitely be going back to this place. 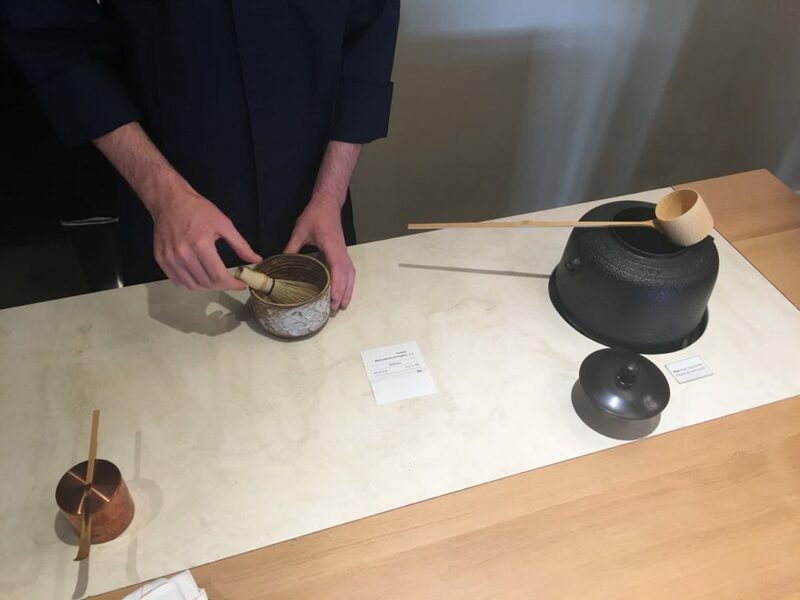 There are a variety of over drinks I didn’t get to try, such as cold-brewed Japanese tea, some matcha “spritzers” made with soda water, and a hojicha latte I’m certain will be phenomenal. There is also a tantalizing food menu to explore as well, including what must be a delicious katsu sandwich. All in all, I strongly recommend Stonemill Matcha. This is the first and only place of its kind in the city. I wish them long life and much success!